Included: English speaking guide. Air-conditioned bus. Cableway Not included in the price. Important: In order to guarantee your place in the cable car, it is necessary to book in advance. Once the tour begins, we can not guarantee the availability of tickets. At 8:00h from Puerto de la Cruz. At 8:25h and 13:00h from Los Cristianos ( South Area). At 11:00h from Santa Cruz. Schedule of pick-ups according to hotel of the client. From The South Area. Morning. From The South Area. Afternoon. Optionally clients can take the Cable Car. It is neccesary to book Teide cable car - Additional ticket to Teide 1/2 day Excursion. This entry to Cable Car is valid only for clients who have previously booked our Teide Half Day excursion. 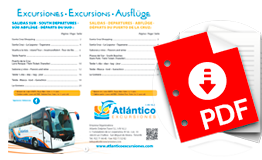 Atlántico Excursiones manages the fast track booking according to the schedule of the excursion. This ticket will be exchanged for the fast track entry on our bus.